Guests and town residents have enjoyed a day of celebration to mark the reinstatement of Morpeth’s Floral Clock. It included a ribbon-cutting ceremony at the feature in Carlisle Park this morning and a free public exhibition about the clock in the Town Hall this afternoon. It was replanted earlier this month by a Northumberland County Council team. 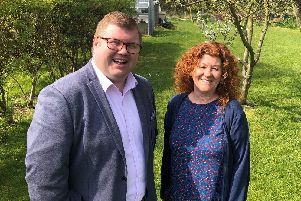 Coun Glen Sanderson, cabinet member for environment and local services at the county council, said: “It has been a privilege for the council to play a small part in this and we hope we can continue to help as time goes on.